A few weeks ago, I wrote about Yoplait’s new lactose free yogurt. Knowing that many people with lactose intolerance often avoid dairy products, Yoplait has put together a new line of lactose free yogurts, available in four flavors – strawberry, peach, french vanilla and cherry. If you’re interested in trying out Yoplait Lactose Free, here’s a coupon for $0.30 off Yoplait Lactose Free. And now for a giveaway! 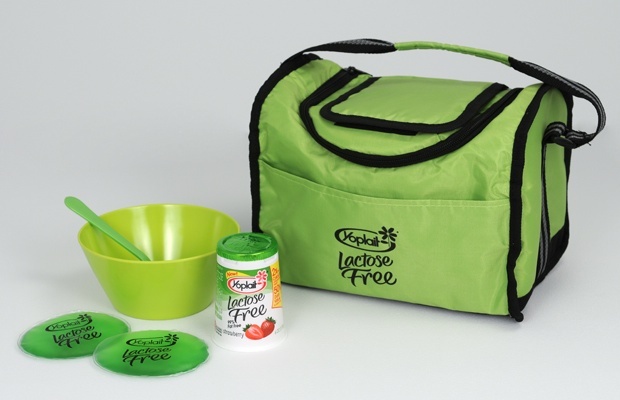 Here’s a chance to win a prize pack which includes: a coupon to purchase Yoplait Lactose Free yogurt*, an insulated lunch tote, 2 gel packs, and a bowl and spoon. *Coupon not valid in some states, including Louisiana, Nevada, New Jersey, North Dakota and Tennessee. Share what flavor of Yoplait Lactose Free yogurt you’re most excited to try in the comment section below, or suggest a flavor you’d like to see available. Giveaway ends Wednesday, February 22nd at 11:59pm EST and a winner will be randomly selected shortly after. Disclosure: Prize pack, information, and giveaway have been provided by Yoplait through MyBlogSpark. No other compensation was received for this post. The post was written by LookyTasty and all opinions expressed are solely mine.